Neem de trein van Venetië naar Padua voor een dagje verkennen met deze tour. Bezoek de Sint-Antoniusbasiliek (Basiliek van Sint-Antonius), de Scrovegnikapel en een van de grootste openbare pleinen van Italië, Prato della Valle. Zie ook het middeleeuwse stadhuis, Palazzo della Ragione. 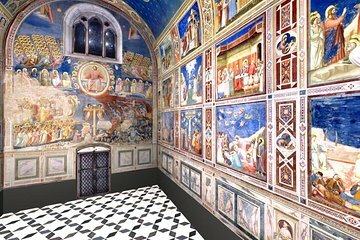 Als je wilt, kun je langer in Padua blijven en naar het Zuckermann Palace of het Eremitani Civic Museum gaan - beide entreegelden zijn inbegrepen bij deze tour. Tour changed time giving very short notice. Guide couldn't manage talk and walk at the same time.so the tour proceeded at very slow pace. Got lost on the way back to car when attempting to find a shortcut. An energetic young woman met us at the train station and was full of enthusiasm for the city she was going to show us. It was both beautiful and interesting, the Basilica of St Anthony, the Giotta exhibit , the marketplace etc all worth spending time in, and the general tour of the town most interesting. A lot of walking at a good clip to accomplish this, but worth the energy. She took us back to Venice and accompanied us part way back to center we stopped for lunch saving us an expensive taxi. She has much to share about the art and architecture of Padua.